Up until about the 18th century, one of the most common methods of division taught was the galley method. The algorithm is very similar to modern long division (after all, how many different ways can you really see how much of one thing fits into another?) but is seemingly more space intensive and, in my opinion, less easy to follow. The method is essentially to remove multiples of the divisor from the dividend, counting the amount removed as we go, until there is no longer enough left over to fit a full multiple. Notice that many of the numbers (indeed, all of the remainders after subtraction is finished) appear in both methods. Galley division is much more compact, but long division looks much less cluttered. While galley division writes the divisor many times and does not right the subtrahend at each step, long division writes the divisor once but writes each subtrahend we come across. The underlying algorithm for both is the same: go from highest place value to lowest subtracting as many multiples of the divisor from the dividend as possible, keeping track of the amount as you go. Since the algorithm is the same, it should go without saying that the answer they arrive at is the same. Now, if you’re anything like me, you’re probably thinking: what does that have to do with a galley? Well, in the words of Dr. Lamb, “If you draw a boat around it when you’re finished, it looks like a boat!” The image below shows what the problem can look like if you choose to make your work look pretty at the end instead of recognizing that math is pretty in its own right and doesn’t need flowery decorations. Image by Francis Rolt-Wheeler via Wikimedia commons. Perhaps the biggest flaw I see in galley division is that it is very cluttered and it can be hard to follow each step since one number can end up being written across multiple lines. By contrast, in long division each step can obviously be seen down and to the right of the preceding one. One strategy that has been used to combat this lack of clarity in the galley method is performing each step of the division and erasing any unnecessary numbers before moving to the next step. I think this is a good compromise. After all, if your work isn’t going to be followable you may as well not show it at all. Like most really old things, we’re not too sure on the particulars of the galley method’s origin. The method is thought to have originated somewhere in China or the Middle East around 400 CE and was probably designed for a sand abacus or abax, which was a table covered in sand where stones and other objects would be used as counters and columns of objects were used as place value markers. The galley method is no longer taught in Western schools, but is still taught in northern Africa and the Middle East and is probably equally as misunderstood and hated by the general public there as long division is here due to a focus on teaching algorithms rather than actual underlying mathematics. Galley division and long division lack an intuitiveness, in my opinion, that seems to be inherent in other methods of division, such as the bubble method (which consists of pulling out “bubbles,” aka multiples, of numbers and adding them together to get the quotient) or the Ancient Egyptian method (which relies on building up the quotient from powers of two). Even though the underlying mathematics are more or less the same, additive methods seem much more intuitive since adding is simpler than subtracting. However, galley division was used for centuries upon centuries before being replaced, so perhaps it’s not as hard as I’m making it out to be. This entry was posted in European mathematics, Practical Math and tagged boat division, division, division method, galley, galley division, galley method, old math on February 17, 2015 by rowri. “Without mathematics there is no art,” said Luca Pacioli, a contemporary of Da Vinci. 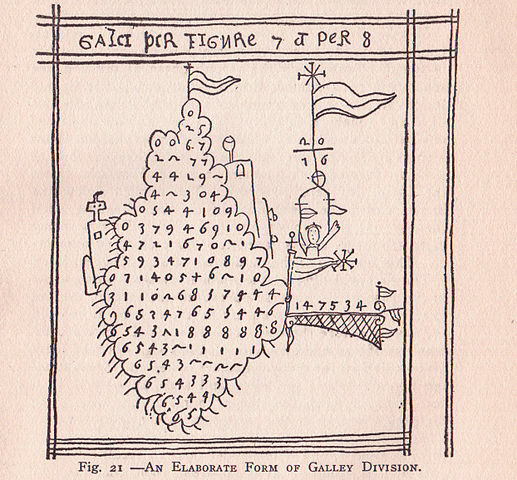 Working through the galley division algorithm made me think about the connection between art and math throughout history. I was curious about the earliest connections – how early did people first begin to see beauty in geometric figures and the patterns found in nature? The Golden Ratio, often mentioned as the earliest convergence between art and math, was considered “aesthetically pleasing”. The pyramids and Parthenon rely on special ratios and math in their construction. Da Vinci famously studied the proportionality in the human body and relied on mathematics throughout his artwork, even using his art to solve a mathematical problem that had burdened the great thinkers of his day. Fractals were a fascinating discovery of infinite repetition that both created beautiful figures and contributed a great deal to modern computing and accurate global coast mapping. “Galley Method3”. Licensed by Soporific under Creative Commons Attribution-Share Alike 3.0 via Wikimedia Commons. Galley division by a 16th century Venetian monk, published in the 1910 book The Science-History of the Universe by Francis Rolt-Wheeler. Image: Public domain, via Wikimedia Commons. While there isn’t evidence of the Egyptians intentionally using Phi or Pi when designing their structures, both numbers are seen in the pyramids’ dimensions with nearly perfect accuracy. Mock pyramids based on both Phi (the golden ratio) and pi, vary from the actual dimensions of the pyramids by very little, on the order of inches. In terms of Phi, this comes down to 1.4 inches, which can be attributed to rounding differences or differences in the estimated dimensions of the pyramids with their covering stones (the pyramids now are missing their smooth outer shells, so what we see today is the structural core). In terms of Pi, the difference between a pyramid based on Pi and the estimated dimensions of the completed pyramids differ by 5.5 inches. So while the methods by which the Egyptians arrived at the dimensions they used, given that the pyramids were built to within 1/15 of a degree of true north, it is doubtful that the presence of Phi and Pi are pure coincidence. As with the pyramids, there is doubt about whether there was conscious use of the golden ratio in the construction of the Parthenon in Greece. The Parthenon was finished in 438 BC, and the first documented awareness by the Greeks of the golden ratio was not until 300 BC in Euclid’s Elements. The golden rectangle can be found in its construction, however there is debate that this may be more coincidental or a case of modern mathematical knowledge informing interpretation. When the spiral of the golden ratio is laid over a photo taken of the front face of the Parthenon without perspective distortion, one needs to assume that the bottom of the spiral will rest on the second (not the bottom) step of the structure, however the spiral is perfectly represented in the area directly over the columns. Da Vinci used art to discover a close approximate solution to one of the greatest mathematical problems of his day, squaring the circle. Squaring the circle is the problem of generating a circle and a square with the same area, given only a compass and straightedge to draw both. He did so through the Vitruvian Man, with 99.8% accuracy (further accuracy even today isn’t possible because of the irrational nature of Pi), and created one of the most iconic images of the Renaissance at the same time. The two shapes, the square and the circle, are drawn simply by changing the positions of the man’s arms and legs, generating each shape with a (nearly) equal area to the other. “Vitruvian Man” by Leonardo da Vinci. Licensed under Public domain via Wikimedia Commons. As a computer science major, fractals are one of the most interesting examples of when math and art have crossed paths. The history of fractals begins with a name familiar to anyone who’s been through Calculus – Gottfried Liebniz – who considered the concept of recursive self-similarity. His musings languished as just that for centuries, partly because mathematicians of his time were resistant to unfamiliar, uncomfortable concepts, going so far as to call them “mathematical monsters”. Progress was made in the early 20th century by Helge von Koch, who drew the familiar Koch Snowflake, a simple and yet incredibly complex definition for self-similar geometric figures. The term we use today was not coined until the 1960s, when Benoit Mandelbrot, working at IBM where he had access to some of the earliest computers, researched objects typically considered “messy” and hard to define – things like clouds and shorelines that were considered utterly random. His research proved they could be reduced to self-similar patterns, and this led to more accurate coastline mapping and measurements. The art of fractals began to take shape in the 1980s with the visual representation of the calculations of fractals, using the increasing computing power of modern hardware and fractal calculating software. Fractal images, Julia and Mandelbrot Sets being two of the most recognized, are fascinatingly intricate, crystallizing years of research and theory in beautiful, “aesthetically pleasing” imagery. This entry was posted in European mathematics, Greek mathematics and tagged fractals, galley division, leonardo da vinci, squaring the circle, vitruvian man on October 8, 2014 by indianacroft.